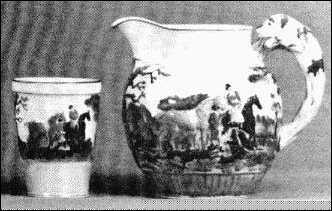 There are two moulded relief patterns with a hunt scene pattern that were used by Wedgwood on jugs. The first pattern shows two huntsmen dismounted with their horses near a gate with the hounds in on the kill on the other side. The identical pattern was used by Spode, New Hall, Davenport and Turner, among other potteries. The Wedgwood version was produced about 1830-1860 in different sizes with various glazes and added decoration. The second pattern seems to have been exclusively Wedgwood's. On the one side two huntsmen converse, one mounted and the other on foot holding his horse and their hounds gather at their feet. The other has a scene much the same as the first version. This second pattern was produced from about 1850 for stoneware jugs and mugs. In 1925 an enamelled Queen's Ware Jug with the handle cast in the shape of a stretching hound with matching Beakers were introduced. 10 inch plates with the embossed and enamelled pattern were offered at the October 1965 Chicago O'Hare Antique Show at $80 each. A version of the set with a cream colour glaze and a silver lustre ground was produced through about 1960. The Wedgwood Cabinet collection includes the enamelled pitcher from 1925 with two matching beakers produced in 1929. The Jug is 6 ½ inches high at the lip. They also hold an example of the Silver Lustre Hunt Jug produced after the move to Barlaston . It is slightly larger than the enamelled version, 6 ¾ inches at the lip. It is marked only with the circular printed Wedgwood of Etruria & Barlaston mark, the hand lettered C 5224 pattern number, an hand lettered B and a printed numeral 2. The cream coloured glaze is slightly discoloured around the base of the jug and there is a slight crack at the lip. The absence of a date code makes assigning an age to the piece only approximate but it was most probably produced c. 1946.